1 of 1 In a medium-size bowl, stir together yogurt, crumbled feta, cucumber and lemon juice. Cover and refrigerate until ready to use. 1 of 3 Combine olive oil, lemon juice, mint, oregano, garlic, salt and pepper in a large resealable plastic bag. Add shrimp, seal bag and shake to coat shrimp with marinade. Refrigerate for 15 minutes. 2 of 3 Heat gas grill to medium-high or prepare a charcoal grill with medium-hot coals. Lightly coat grill rack with oil or nonstick cooking spray. Place shrimp in a grilling basket and grill for 3 minutes. Baste once with the remaining marinade. 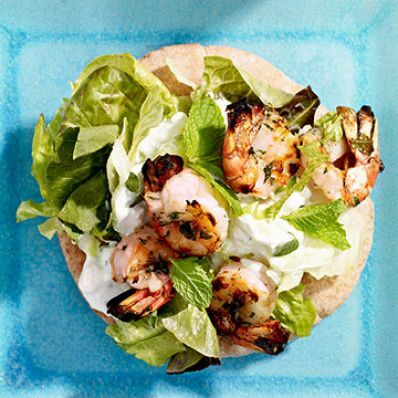 Turn shrimp and grill for an additional 2 to 3 minutes or until shrimp is cooked. 3 of 3 To serve, equally divide the salad, sauce and shrimp over each pita. Add onion and tomato, if desired.